If you are one who gave your heart and your life to the Lord, repented of your sins, an if you have been baptized and brought into the Church, by the direct commission of God you are the salt of the earth. You may say, “but I didn't ever want to be the salt of the earth.” You don't have a choice God has commissioned you to be the salt of the earth. If you're a child of God you are the salt of the earth. But then God gives this unbelievable warning and in it is a statement that somehow I overlooked. “You are the salt of the earth. But if the salt lose its savour, wherewith shall it be salted?” here's the three words I missed... the next three words say it is, “good for nothing”. Let's say we are all sitting in a large theater waiting to see Jesus. We are waiting for Jesus to come into the room. Once he comes into the theater he begins to walk the aisles. Now let's just say while he walked the aisles we were to say, “show us the ones here that are good for nothing.” What would happen when he came by me? What would happen when he came by you? In this moment, as you are reading this, I want to ask you this question. How's your salt? Can I submit to you what we as Catholics are watching happening in America is we're being cast out and trodden under the foot of men. A friend of mine was in Australia and there were missionaries he met there, who would be going to the foreign field. Out of the several missionaries, three of them were foreign missionaries coming to America. When they said they were going to come over to America as missionaries, immediately something welled up inside of my friend, and he said “No! No! you don't need to come. We will handle America you go where you're needed. And then they gave their testimony. We have lost the culture war in America but we have not lost the country yet. I'm positive, based on the Word of God, we do not have to lose our nation. But here's the key. The fate of a nation never rests with the infidel. The fate of the nation rests with the Catholic Church. And the question is, will we be the salt that God has called us to be. Before pursuing the priesthood, I was a Meat cutter. I got to do everything from help raising cattle all the way up to seeing a slaughter house. In the slaughtering business you can slaughter anywhere from five to seven thousand head of cattle a week. When you slaughter five to seven thousand head of cattle you end up having five to seven thousand hides every week. Those hides are valuable. What would happen with them would be that after the animal was slaughtered, people would clean it a little bit but then they would stack them and wait for the highest bidder to by them. They would be stored in huge warehouses and you would find a layers of hides laying down with salt in between each hide. You see salt stops the decay. That's why you put the salt between each layer of hides The warehouse would be stacked high with these salted hides. One man said he walked in with his grandfather one time and the stench was overwhelming. It was the kind of smell that once you got it you tasted three days later. This man said, “Grandpa, why does it smell so bad in here?” His granddad looked at him and he said only two words. “Bad salt”. The people at the warehouse did everything they were supposed to do but the salt didn't do its job. This salt was no good. The young man asked, “What can they do with them?” His grandpa said the salt and hides had no value the hides had to be destroyed and the salt needed to be basically cast out and would be trodden under the foot of men. 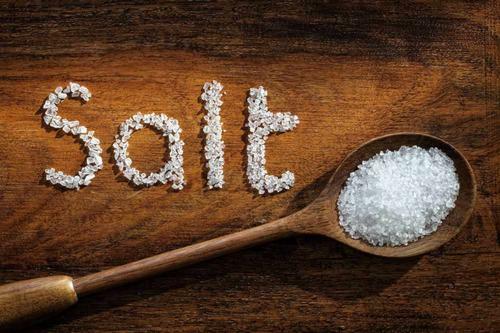 How do we get our saltiness back? There is a scripture that I believe gives you five keys to making our salt salty again. “If my people, upon whom my name is called, being converted, shall make supplication to me, and seek out my face, and do penance for their most wicked ways:...” Notice if we do these five things. God gives us two promises. “then will I hear from heaven, and will forgive their sins and will heal their land.” The only hope in America, (or any other country where Catholics are the salt), is that God does something. The answer is not in any election. It has never been in any election. We have been deteriorating spiritually under the Democrats. We have been deteriorating spiritually under the Republicans. Why? Because the answer is not in a political party or a political philosophy the answer is Jesus Christ and His salty Church! That's the answer. Take these five things you just read and take inventory of your heart. Put your life up against them because these are Gods salt markers. He says you do these five things and I will heal your land. Please note what it doesn't say “if my people who call themselves by my name”, it says “if my people upon whom my name is called”. When anybody is looking at you or if anybody was looking at me would they say, “that has to be a real Christian” Do you live, do you carry yourself, is your personal holiness, is your conduct, is your dress such that someone says, “that's got to be a real Christian man or woman”. Or has this culture so conformed us that if we didn't tell them they never would have guessed? Would anybody buy that you were a Christian? Would anybody buy that I was a true Catholic Christian if we didn't tell them. You know what it means to humble yourself? It means to get small you can't be humble and be proud and the enemy of humility is pride. But can I remind you God says, “God resisteth the proud,” (James 4:6) If you're proud you got God against you. It is not God threatening you. This is God promising you. He is not talking about the infidel. He is addressing the Catholics! People will text me and message me and email me and they will say “everything's going wrong! I can't explain it!” and I want to ask, “You don't have any pride in your life do you?" Because if you got pride in your life you got God against you by his promise. The devil will do everything and anything in his power to keep you from prayer because you understand when you pray then God starts working. Those who are called by His name, those who are humble, when they are steadfast in their prayers, God starts answering. What does it mean to seek Gods face? I believe to seek his face means you go to him because you just want him. Not that you need something from Him. But that you just.....want...to spend time with....Him. Oh how I love to be before the Tabernacle knowing that my Savior is in there. There are times when I just want to go before him and sit. Nothing else. Sometimes I want to sing to Him. Sometimes I want to give thanks and praise to Him while sitting there before Him. When's the last time you went to the Lord? When is the last time you said, “I just want you and I'm not coming to get something I just want you” How would you feel if your kids only came to get something from you but then after they got what they wanted they were out of there. They didn't want you, they just wanted what they could get from you. When's the last time you went to Him just to be with Him and to seek his face? Listen, the problem is not sin in Washington, the problem is not sin in Sacramento, it's not a candidate's sinful life. The problem is sin in my life...sin in your life. "Do penance, repent, turn from your wicked way." And when we as Catholics do this, God says, "then you'll hear from heaven and will forgive your sin and I will heal your land." We have the power to change everything in America but we better get our salt back. God's people are aggravated with what they see in America. They're disgusted with what they see in the Church. They are disgusted with all sides but we don't want to accept the responsibility. We want everybody else to change not us. Would you be willing to humble yourself and pray and seek his face and turn from your wicked way? Because our God says if you'll do that “I'll forgive your sin you'll hear from heaven and then He says I will heal your land.